There are several ways to fix cracked or broken teeth, and dental bonding is one of those procedures. 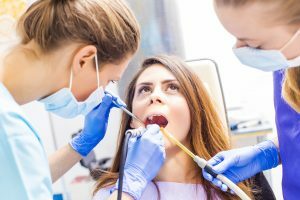 It differs greatly from applying a dental crown or other methods of fixing chips, which we will discuss in this article. Dental bonding is a less invasive and inexpensive way to fix issues with your teeth, and it can also restore proper coloration as well. It involves attaching a composite to the tooth and creating the right shape by sculpting it, and afterward, exposing it to a high intensity light in order for it to harden before it undergoes being polished and smoothed out. The fixture is the same color as the tooth, and when it is affixed to it, it creates a long term bond. It can also be used as an alternative to using silver fillings for cavities, and it can be used to close small gaps that occur between the teeth. You can anticipate that your dentist is going to apply phosphoric acid to your teeth first, as its job is to create a rough surface that the bonding material can easily adhere to, and phosphoric acid is mild, so it will not hurt you. Afterward, the dentist will apply the putty-like bonding substance, before shaping it into the proper contour. Dental bonding is a treatment that is likely to be covered partially or in full by a patient’s insurance company, and this is especially true if it is used to fill in a cavity. The process is speedy, and it can usually be completed with just one visit, requiring between 30 and 60 minutes for each tooth. This method also does not necessitate the use of anesthesia, unless it is used to fill in a tooth that has experienced decay. Although dental bonding will not last as long as a crown or a veneer, you can expect it to endure for three to seven years. Dental bonding can be an appropriate choice when your situation does not entail major corrective surgery and when it involves scenarios like repairing chipped, cracked, or discolored teeth or having cavities filled. It can also be used to reshape and contour points, irregularities, and slight overlaps, but it cannot be used as a substitution for whitening all of your teeth. In order to prevent discoloration, avoid smoking, and do not drink beverages, such as coffee, tea, and red wine. Avoid biting down on ice, carrots, or other hard items, as this can chip, and do not chew on your nails or on other tough objects. Your dentist can, however, help you if you do nick your teeth in a way that causes damage to occur. Keith L. Schwartz D.M.D. is experienced in serving those in the Coconut Creek, Florida area, and he provides a variety of services, including crowns, implants, veneers, cosmetic dentistry, and more. Contact the office of Dr. Keith L. Schwartz, D.M.D. to schedule an appointment to discuss if dental bonding is right for you.